January | 2017 | and a beauty to you! My grandfather, Charlie Upchurch, had a love of food and was very particular about what he liked to buy and eat. Loved citrus fruit. He felt like it was the most exciting thing happening in February. He also loved baseball, and oftentimes would go to Florida to spring training. It was there he developed a greater knowledge and specific favorites when it came to citrus. Returning home with his new-found specifics, he’d be on the phone the next January ordering shipments of Indian River specific varietal grapefruit, and his favorite (and therefore, mine) the Temple orange – which I would describe as the most exotic, complex fruit on the market today. I’ll write another post about Temple oranges when they hit the shelves for their very short season, but I have a different story to tell today. 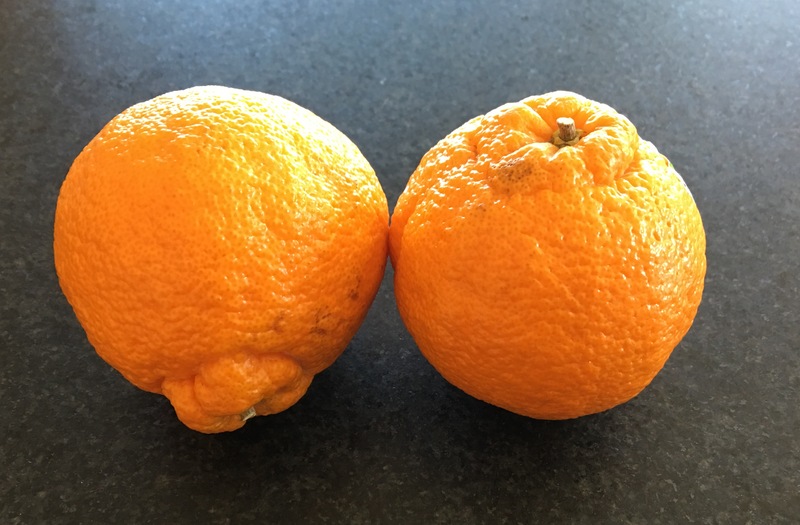 “In the 1970’s a citrus grower from the Kumamoto Prefecture in Japan set out to develop a fruit which would combine the best of the easy-to-peel Japanese Satsuma with the big, juicy, sweet oranges from California. Although he saw promise in an obscure tangerine-orange hybrid, this new fruit was challenging to grow. Thankfully, our grower persevered. Over time, he developed a series of methods for growing, pruning and thinning his trees, which is different from all other citrus. It took over 30 years but his hard work was rewarded when recently, this new variety became the most prized citrus fruit in Japan and Korea. Following the Japanese tradition of offering the best fruit as a gift, one can find it in Tokyo gift shops, selling for up to $8 for a single piece of fruit! Now this legendary fruit, which is called Dekopon in Japan and Hallabong in Korea, is finally available for the enjoyment of consumers here in America. Grown on our families’ farms in California’s Central Valley to the same exacting standards of the original Kumamoto farmer. It is the biggest mandarin you’ve ever seen. It has a distinctive shape with a prominent ‘top-knot.’ The peel is bright orange, bumpy and loose so it peels effortlessly. The delicate sections separate easily. 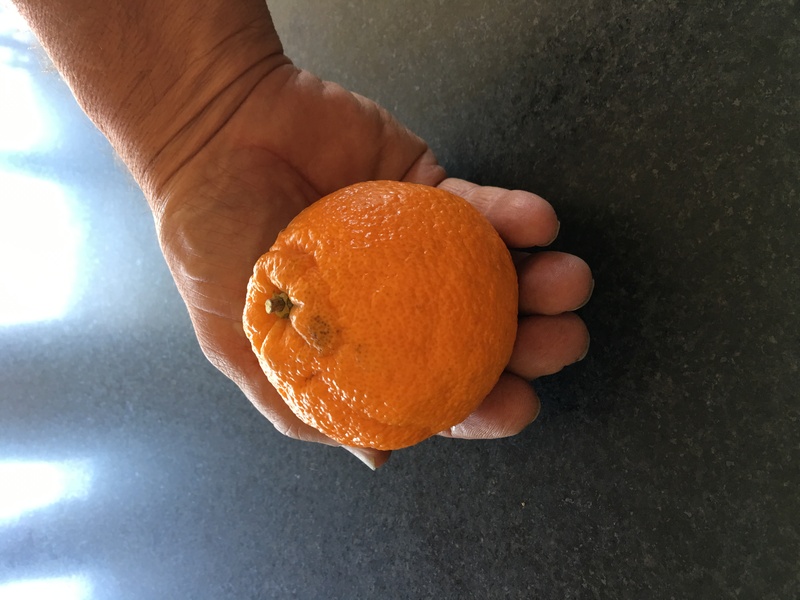 It’s seedless, juicy without being messy, and it is quite probably the sweetest citrus you’ll ever eat.” – We got this text from a group of farmers in California that probably have secured rights to this hybrid mandarin. At this point, the fruit is not organic because a group of growers has rights to the variety, for now. The way it usually works is if the commercial farmers are successful over a period of time, the hybrid will eventually be available to organic growers – but that might be 25 years from now. I recommend you go try a few and see for yourself.